14 year old Ahmed Mohammed was arrested, interrogated, and suspended from school for bringing in a digital clock he made at home. Kids shouldn't be punished for curiosity and an interest in science. This has to stop. Sign the petition to get justice for Ahmed! 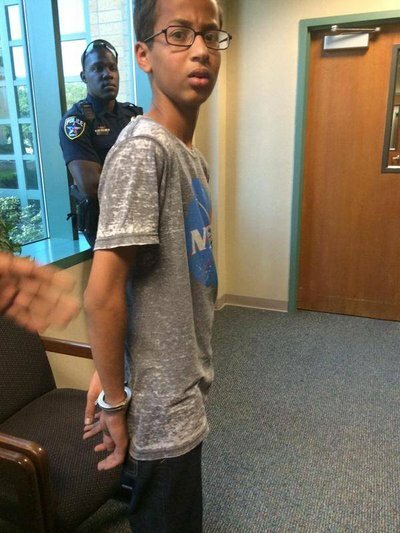 Tell the police and Ahmed's school: "Curiosity and an interest in science are not a crime! Stop harassing Ahmed Mohammed, do not bring any charges against him, and remove his suspension from his school record." Thanks for signing. Now tell others. Kids shouldn't be punished for curiosity. Let's get as many people as possible to sign this petition so that we can make sure this doesn't happen to other kids like Ahmed. No one should be punished for curiosity. Especially not high school students. His name is Ahmed Mohammed. He loves tinkering, building, and inventing things and was a member of his middle school robotics club. He builds his own radios and fixes his own go-kart. When Ahmed came to school with the clock that he had built out of a circuit board, a pencil case, and a digital display, he was hoping to impress his engineering teacher. Instead, he was arrested, taken out of school in handcuffs, interrogated in a room by 5 police officers, and suspended for 3 days -- all because one of his teachers thought his clock was a "bomb." Even now the police say they still might charge Ahmed with a crime and the school is leaving his suspension in place, simply for being curious about science. We think he ought to get an "A" in engineering. Ahmed has said he’ll never bring one of his inventions to school again. That's exactly the wrong message to be sending creative kids who are passionate about learning. It's ridiculous for any student to be punished for something like this, and even more disturbing given the town's history of Islamophobia, and the culture of fear that led to Ahmed's absurdly unfair treatment. Watch the video below to see Ahmed talk about the whole ordeal in his own words. It's so obvious he's a sweet, smart, and pretty adorable kid. Make sure you sign the petition above and share it with everyone you know. We need to make sure what happened to Ahmed never happens again, so our kids can grow up without being afraid to learn and create.